In the ongoing process of Emirati nation-building, the military has a salient role: in the eyes of government officials it contributes to shaping a cohesive and recognisable national identity, also differentiating the United Arab Emirates (UAE) from the neighbouring monarchies. In official discourse, Emirati soldiers embody the sacrifice, sense of belonging and patriotism, that render them ‘heroes’ and ‘positive models’ for the nation. What, then, are the military drivers of nation-building in the UAE? As a matter of fact, the process of building the Emirati state (which today consists of the emirates of Abu Dhabi, Dubai, Sharjah, Ras al-Khaimah, Ajman, ‘Umm al-Quwain and Fujairah), following the 1971–2 unification, was driven by oil revenues, unlike many state-building trajectories in the Arab world which had been marked by the unifying experience of independence wars. However, from the 1990s onwards, efforts toward strengthening the federation of the UAE have focused on modern integration among the seven armed forces (especially after the federal integration of Dubai’s military structure in 1997), which has allowed Abu Dhabi to solidify its leading role. In recent years, the UAE has been publicly emphasising the topic of Emirati national identity, with the purpose of consolidating a sense of group-ness at a time of multidimensional threats in the region: naturally this also relates to national security. As a result, the UAE has engineered a series of top-down measures and initiatives aimed at fostering national feeling, including art exhibitions and festivals centring on shared history, national museums and heritage sports. Concomitantly, it has implemented conscription for nationals, held celebrations for Emirati soldiers sent abroad (including public commemorations of the war dead) and developed a national defence industry: these are the primary military drivers of nation-building in the UAE. The introduction of conscription for male citizens in 2014 has represented a shift in thinking regarding the UAE’s state–society relations: for the first time, nationals have been called upon to defend the country by serving in the military, so as to build a reserve force. Emirati males between the ages of 18–30 must now complete a term of service of between 16 months and two years, depending on their level of education. Emirati women can voluntarily enrol for twelve months. In addition to the strictly military rationale, conscription aims to “Emiratise” citizens’ collective identity, beyond social, tribal and local differences: it acts as a cultural tool of nation-building, forging the identity through collective experiences to instil a sense of belonging and group loyalty vis-à-vis the nation. In the UAE, nationals represent less than 20 percent of the whole population with 61 percent of them living in the northern emirates (such as Ras al-Khaimah) the compulsory draft further serves as a way to better integrate peripheral emirates within a national project promoted from and by Abu Dhabi, strengthening the ties with the federal political centre. Not by chance, conscription is designed firstly as a national education programme, although encompassing a lengthy (16 months is significantly longer than the term of service required by neighbours Qatar and Kuwait) military component. Lectures on patriotism form a key part of the programme. The military intervention in Yemen, which began in March 2015, has also represented a watershed moment for the Emirati armed forces, until that point only accustomed to mobilising for peacetime support operations. In Yemen, Emirati soldiers have focused on ground operations, including stabilising areas and critical infrastructure, and fighting jihadi groups, but primarily their mission has been to train and assist local forces in the country’s south. In the UAE, citizens have become familiar with the images and stories of soldiers deployed abroad, widely disseminated in the media; and they have been shocked by the death of a number of Emirati soldiers in Yemen (more than 200 so far according to an unofficial estimate), a new experience for the country. On 4 September 2015, forty-five Emirati soldiers (many of them nationals) were killed in a Houthi attack in Yemen’s Mareb region. 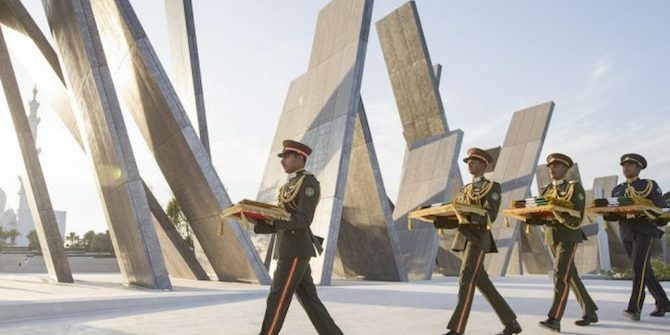 To mark that occasion of collective mourning, local media and officials established the country’s Commemoration Day, which celebrates the ‘martyrs of the Nation’ killed while performing their duty abroad. In November 2016, the Martyrs Families’ Affairs Office of the UAE installed the Wahat al-Karama (Oasis of Dignity) in Abu Dhabi, a permanent memorial to the Emirati soldiers who lost their lives serving the nation. Fostering a ‘rally around the flag’ effect, soldiers also serve as effective identity-mobilisers, drumming up national, and in some cases nationalist, feelings in a society even as heterogenous as the UAE: an important step in nation-building. The development of a national defence industry has indirectly supported the politics of nation-building. The UAE, with Abu Dhabi at the forefront, has worked hard to become an emerging arms producer, with an eye on the regional export market: this commitment aims not only to diversify the rent-driven Emirati economy, but also to sustain an increasingly ambitious foreign policy. The ‘Made in the UAE’ defence industry brand functions to support national awareness and prestige, despite actual Emirati production only playing a small part in it, given the tiny national population and the lack of nationals with advanced technical skills. Some of the ‘Made in the UAE’ defence manufacturing, including the Nimr II Ajban 440A 4×4 tactical vehicle and the Baynunah class corvettes, have been sent to Yemen for use in active service, thus providing a direct military link between national projection and military production. Identity formation in the United Arab Emirates is an ongoing process, with the military component a distinctive feature. Top-down initiatives (including conscription and the commemoration of soldiers killed in Yemen) trigger bottom-up feedbacks at a social level, especially among young urban-based nationals, who are often less attached to the traditional Bedouin values of their parents. As a result, connecting military principles, duties and prestige with the nation is a way to bond the second generation of Emirati nationals to a new collective myth, contributing to forging national cohesion for current and future generations. Eleonora Ardemagni is Associate Research Fellow at the Italian Institute for International Political Studies (ISPI), Teaching Assistant at the Catholic University of Milan and Gulf Analyst for the NATO Defense College Foundation. Her research focuses on Yemen, the Gulf monarchies and Arab military forces.